Intertitle: What job should the next President do for a day to under­stand the coun­try bet­ter? Jamelle Bouie: I think the next President should work in a fast food restau­rant for a day. So many more new jobs, ongo­ing jobs, ser­vice jobs… So many of these ser­vice jobs are not filled by teenagers, but they’re filled by twenty‐somethings, thirty‐somethings, reg­u­lar work­ing peo­ple. Finding a way to make sure these ser­vice jobs aren’t, if not good jobs at least well‐compensated jobs, actu­al­ly work­ing one and see­ing what a drag it is, is very impor­tant. 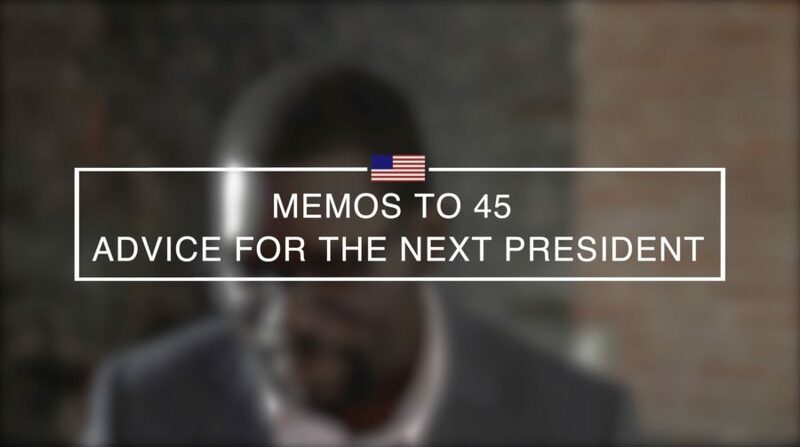 Intertitle: What over­looked issue will cause a cri­sis for the next President? Bouie: Housing costs. In our most pro­duc­tive cities, here in DC, San Francisco, and New York, hous­ing costs are just incred­i­bly high. And it’s not so bad for the wealthy, but it’s detri­men­tal for middle‐class peo­ple. It cre­ates a bar­ri­er for work­ing peo­ple who want to live in cities and be next to this pro­duc­tive capac­i­ty. And it’s a bot­tle­neck on younger peo­ple who want to move to pro­duc­tive cities, to do more and to advance their own careers. Bouie: The United States needs a stronger labor move­ment. It needs some­thing to orga­nize work­ers as work­ers, just for the sake of act­ing as a polit­i­cal coun­ter­bal­ance to cor­po­ra­tion and to large for­ma­tions of cap­i­tal. I think a lot of our prob­lems right now are direct­ly traced back to the decline of unions. So with that in mind, I think that the next President should have a por­trait of A. Philip Randolph in the White House. Randolph is a hero of the labor move­ment, some­one who helped orga­nize count­less African‐American work­ers. And specif­i­cal­ly, because he helped orga­nize African‐American work­ers. One of the great weak­ness­es of the labor move­ment in the 20th cen­tu­ry was the racial divide. And I think going for­ward, a mul­tira­cial labor move­ment is absolute­ly nec­es­sary to build­ing a coun­try more hos­pitable to middle‐class peo­ple. And Randolph I think was a pio­neer of the kind of labor move­ment that we need. Introductory post about this series at Slate, and for this installment, at the New America site.